Jaderosin is made by a venerable French manufacturer, steeped in formulating professional quality rosin for well over a century. Jade rosin is a new, refined formulation, with remarkable qualities of dust-free adhesion. Avoiding metallic residues, which do not contribute to adhesion and may indeed scratch fine varnishes, Jade rosin incorporates highly refined resins to produce a smooth yet firm grip. From symphony musicians to concert artists, Jade rosin has received enthusiastic acclaim. Each rosin is mounted on a protective velvet cloth wrap and comes with its own attractive lidded container with gold and slate graphics. 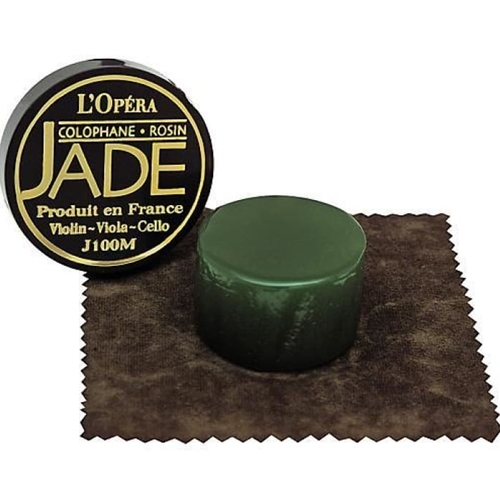 Jade rosin is suitable for violin, viola, and cello.